Now is a crucial moment for access to healthcare in our nation. Repealing the Affordable Care Act (ACA) could cause 32 million Americans to lose health insurance and raise premiums by up to 100% by 2026. With lives on the line, Congress must treat healthcare as a right, not a privilege, and recognize that access to healthcare is required to protect the fundamental dignity of every person. Some plans being considered by Republicans in Congress would not only repeal the ACA without much of any replacement, but also cut Medicaid and the healthcare services it provides to people in poverty, children, older Americans, and people with disabilities. Some in Congress would like to use these cuts to pay for unprecedented tax cuts to the extremely wealthy, further widening the gaps in our society by shifting resources from families struggling to make ends meet to the very wealthiest. Cutting Medicaid would further erode the promise that if you fall on hard times in this country, you will be taken care of. Beyond political rhetoric, this moment is really a decision point for the kind of country and society we want to be. Are we a society which leaves people experiencing hard times out in the cold, or are we our sisters’ and brothers’ keepers? Catholic Social Justice requires that we uphold the dignity of all, which requires ensuring all have access to affordable, quality, equitable healthcare. This moment presents a threat, but also an opportunity to share our faithful vision of a healthcare system and society that advances the common good and puts people, not profit, at the center. 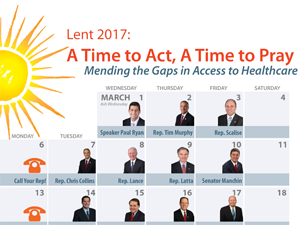 See the Lent Calendar for which Member of Congress the NETWORK community is calling each day during Lent! This entry was posted in Front Page, Policy Update on February 28, 2017 by networklobby. I called Rep. Scalise on Friday. I believe he answered the phone. I introduced myself and told him I was concerned about the health act, before I could finish my remarks he abruptly interrupted me and said he had other calls waiting and then hung up. Sounds like he is a “party” man!